On this final day of February I am thinking about the acceptance speech made by Viola Davis after she won the Oscar (Academy Award) for Actress in a Supporting Role. Davis is a fiery, passionate and powerful actress and her performance in Fences was great. She can be strong or vulnerable, depending on what the role requires. What she showed us in her acceptance speech was her love of both acting and the storytelling that movies can bring us. She says it is the only profession telling the stories - not quite true in my opinion, but I get where she's coming from. One of her signature lines in her speech was the urge to exhume the stories. She means dig the up, unearth the rich tales of humanity and bring it to us in the drama of film. Personal Historians do the same thing, whether working in video, audio or the written word. Exhume the stories. Yes! Telling the world about the lives of people is a vital part of our need to hear what makes us all human. The good, bad and the ugly. We need to share our humanity through stories and life story work is a vital part of this process. Today is the Presidents Day holiday in the United States. Many people consider the President of the United States to be the most powerful leader in the world. That likely is because the United States is considered by many to be the most powerful country in the world. Whether it is true or not that the USA is the most powerful country in the world, thereis a great responsibility that comes with the power of being president. The POTUS, as the president is sometimes referred to, is viewed as an important figure. Although the history of the United States is not as lengthy as some countries, this great experiment in democracy has lasted nearly 250 years. Every four years there is an election held to determine the leader. I've been thinking about the perspective that comes with living long enough to note a number of individuals who have held this office. I was born in 1955, so that means Eisenhower, Kennedy, Johnson, Nixon, Ford, Carter, Reagan, George H.W. Bush, Clinton, George W. Bush, Obama and now Trump. Viewing my life through that particular lens of history reveals more than the daily drama we are currently experiencing. There has been a great divisiveness in the "land of the free and home of the brave" the past few years. But it is not the first time. 150 years ago our country was nearly ripped apart by a civil war. The president at that time was not as widely respected then as he is now. His burden was very great and when the war between the states ended he felt it important to begin a healing process. History has judged Abraham Lincoln to be one of the greatest presidents. Presidents come and go and the legacy they leave is there for the viewing. The best ones, in my opinion, are those who tried to do the right thing, especially in times of moral dilemma, and who recognized that as leaders their responsibility was to lead and not to rule. Perhaps there is a lesson in that for us all. The topic of immigration has been widely discussed over the past year, and then some. 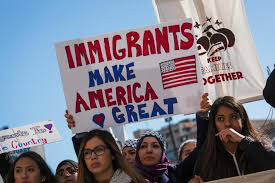 The United States is a nation built by immigrants, yet the issue of more immigrants coming into the country sparks an often heated debate. President Donald Trump and his administration want to crack down on immigrants and refugees coming into the country. There has been a court battle over his executive order to ban immigrants and refugees from seven predominantly Muslim countries (link to story). Surely you've followed the news. What I find fascinating from all this is how from a personal history perspective the diversity of people from various countries, cultures, religions and ethnicities makes for a rich story. Here in New Mexico there are a lot of people who are of immigrant stock. Many of them live here and are not at this time United States citizens. Nevertheless, they contributre to the economy and most of them are hard working and caring people who want the best for their families. Today's Day Without Immigrants protest has put a spotlight on many businesses that are run by immigrants. A lot of them shut down for the day as part of the protest, or had workers who took the day off. A CNN story spotlights some of the stories of these people. It is interesting to read about how some of them worked hard yesterday to prepare for taking the day off, such as restaurant workers who did extra prep work so as not to leave their bosses in the lerch since they would be operating with a smaller staff today. Wherever you are on the issue of immigration it is important to consider the humanity of those who travel to other lands in search of a better life. Those stories are often rich tales of overcoming adversity, the kind of personal history that is important as part of the history of our land. I saw the excellent Budweiser commercial about Adolphus Busch's journey to America online when it was released a few days before the Super Bowl. Budweiser has spent a lot of money over the years advertising during the Super Bowl and usually the commercials are either comedic or aimed at sentimental stories about dogs and Clydesdales. This commercial was different. In a well made and edited minute we get the story of immigrant Adolphus Busch and his journey to America in 1857. His dream - to brew beer. He faces hostility and adversity before eventually meeting and having a drink and handshake with his future business partner, Ebert Anheuser. The commercial reminds us that it is not easy to leave a homeland for a new country and opportunity. Today there are people who don't want anyone coming into our country. But there are also those who welcome those seeking a better life and following there dream. Apparently this commercial struck a chord with a lot of viewers during this past Sunday's Super Bowl. You can view it online here.